"Fire Mage is an entertaining fantasy novel that will keep you turning the pages for more. You don't want to miss it!" 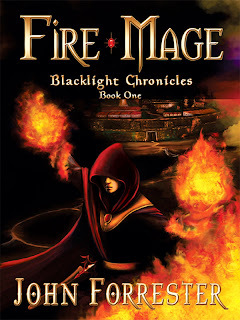 "Fire Mage is a fast paced, action packed... I devoured it very quickly and was glued to the pages... I cannot wait to read to read what is coming up next in the amazing Blacklight Chronicles." "I really enjoyed this book. It was a fast paced fantasy adventure, great for young readers. It was an easy and entertaining read. I really liked the chemistry between Talis and Mara... a really great read for pre-teens and teens." For centuries, mages perfected magic at the Order of the Dawn. Mastery over fire, wind, and storm. They live in the last free city in a world plagued by dark sorcerers. Talis Storm and friend Mara discover a terrible secret. The Jiserian Empire has targeted their city for attack. An army of undead soldiers. Flying necromancers. None have ever survived. When a surprise aerial invasion hits the Order’s temple, Talis casts fire magic for the first time. But his spell is wild and does more harm than good. Sorcerers try to capture Talis and Mara. They flee into the temple crypts. Awoken from an ancient rest, a fallen champion slays the sorcerers and gives Talis a legendary map, leading them on a quest to discover the lost temple of the sun. To save his city, Talis must discover the power of magic locked away inside the ancient temple. And become a true fire mage. Author of Fire Mage, Sun Mage, Shadow Mage, Dragon Mage, and Star Mage of the fantasy series Blacklight Chronicles.